So, Should You Go to the Belmont This Weekend? And so we should be able to learn a lot about the Yankees over the next month or so. They've gotten off to a good start in June — they're 4-1 so far this month — and they've won five out of six and ten of their last thirteen. And so far against the Rays — the first of those teams in the 30-to-32 win range — the Yankees' starting pitching has been impressive. 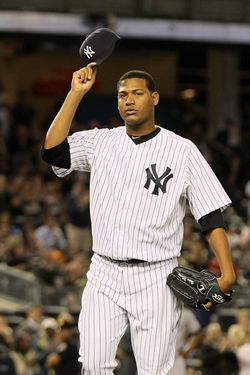 On Tuesday, Andy Pettitte threw seven and a third innings of two-hit shutout ball, and last night, Ivan Nova took a two-hitter into the ninth, finishing the night with an excellent line: eight innings, four hits, one earned run, one walk, and five strikeouts. Nova has struggled some this year — he'd given up at least five runs in five of his last seven starts entering last night's game — but he twirled a gem last night, pitching into the ninth inning for the first time in 45 career starts. We'll continue to preface any update of the standings by reminding you that it's June and one should take such movement for what it's worth, but the Yankees leapfrogged the Rays in the A.L. East with last night's win. They're still a half-game behind first-place Baltimore, though. CC Saabthia pitches tonight against David Price.